For more than five decades, multi-award-winning press photographer Bruce Postle captured significant moments in Australian life. His collection of over 60,000 images is a national treasure chronicling the highs and lows, tragedies and triumphs, heroes and villains of Australian life through the golden age of press photography. 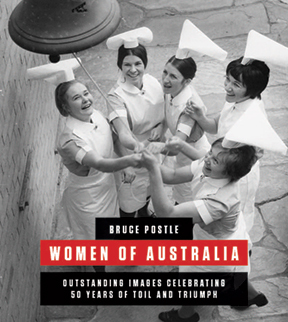 Women of Australia presents 180 of Bruce Postle’s greatest images portraying the lives of women in Australia over half a century: from childhood, recreation, vocations and partnerships, to activism, trailblazing and public life. There are the famous and the infamous, the expected and the unexpected, the quiet achievers and the Aussie battlers.